Now, as the edges of my field of vision are beginning to darken, I sometimes wonder if I will ever finish the Temple and whether all I have done so far has not been a wretched waste of time. But on other days, when the evening light streams in through the window and I allow myself to be taken in by the overall view, then I see for a moment the Temple with its antechambers and the living quarters for the priesthood, the Roman garrison, the bath-houses, the market stalls, the sacrificial altars, covered walkways and the booths of the moneylenders, the great gateways and staircases, the forecourts and outer provinces and the mountains in the background, as if everything were already completed and as if I were gazing into eternity. In Campo Santo, W.G. Sebald writes about a hike he made – a sort of pilgrimmage, really – in Corsica, the site of some of the last great forests in Europe. Although the truly ancient forests were already gone, Sebald quoted witnesses and momentarily imagined that the forests had never been cut down. The English landscape painter and writer Edward Lear, who traveled in Corsica in the summer of 1876, wrote of the immense forests that then rose high from the blue twilight of the Solenzara valley and clambered up the steepest slopes, all the way to the vertical cliffs and precipices with their overhangs, cornices, and upper terraces where smaller groups of trees stood like plumes on a helmet. On the more level surfaces at the head of the pass, the soft ground on which you walked was densely overgrown with all kinds of different bushes and herbs, Arbutus grew here, a great many ferns, heathers and juniper bushes, grasses, asphodels, and dwarf clyclamen, and from all these low-growing plants rose the gray trunks of Laricio pines, their green parasols seeming to float free far, far above in the crystal-clear air. By an odd coincidence, two recent museum visits led me to two very dissimilar artworks, both based on creating something new out of a large tree trunk. At the Olympic Sculpture Park in Seattle, I visited Mark Dion’s Neukom Vivarium, 2006, a wonderful stand-alone greenhouse that holds a sixty-foot long section of a real Western hemlock that has been moved from the site where it fell in the Duwamish/Green River watershed. This tree had fallen in 1996 and had become a nurse log, developing the unique ecosystem of plant and animal species that would help it eventually decompose. 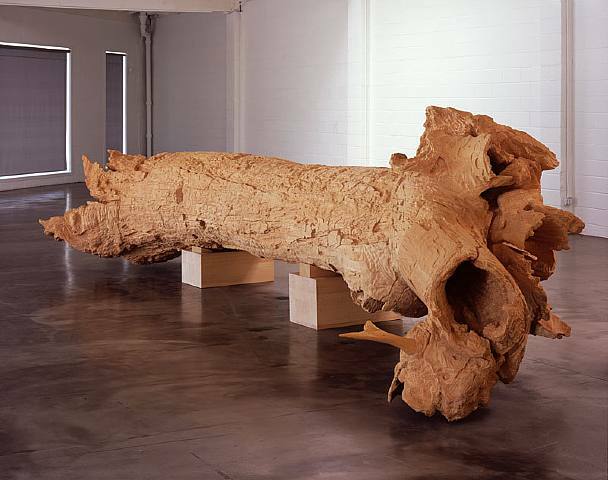 For its new home in Seattle, Dion, an artist who has created many installations based on museums and natural history, has tried to recreate an environment nearly identical to the one where the tree originally lay. The visitor experience, then, is to be able to “observe the teeming life forms that make the log their home” and to demonstrate “how difficult, indeed how futile, it is for humans to attempt to replicate what nature does by itself even in this age of high-tech science,” writes Lisa Graziose Corrin in the Field Guide to the Wildlife of Mark Dion’s Seattle Vivarium. While the green house environment is exceptionally high-tech, Dion’s project is deliberately history bound. The interior of the building is decorated in blue Delft-like tiles (too green in my photograph) that illustrate the insects, plants, and animals found in the tree’s ecosystem. Furthermore, the artist has stipulated that the greenhouse cannot open without the human presence of one of the trained docents who serve as “park rangers.” Here’s Dion talking about his piece. Ten years ago, while driving up the central coast of California, I spotted a fallen tree in a meadow just off the highway. I was instantly drawn to it. It was not only a beautiful log, but to my eyes, it was perfectly embedded in the meadow where it had fallen decades earlier. Pressure from the weather, insects, ultraviolet radiation, and gravity were evident. Total collapse appeared to be no more than a handful of years away. I was inspired to make a sculpture and studied many other logs, but I realized that I was only interested in this particular one. At one point, I determined that its armature could be its pneuma, the Greek word for breath, wind, or life. Later, I considered making an inflatable sculpture but realized that the tailoring of the form would bring an unwanted complexity to the surface. It then struck me that the breath or life of the sculpture could be manifested in the very act of sculpting. Making a wood carving of the log by starting from the inside and working my way out would bring a trajectory of life and intentionality to this great fallen tree. With several friends, I transported the tree, cut apart by a chainsaw, back to my Los Angeles studio. Silicone molds were taken and a fiberglass version of the log was reconstructed. This was sent to Osaka, Japan, where master woodworker Yuboku Mukoyoshi and his apprentices carved my vision into reality using Japanese cypress (hinoki). I was drawn to the woodworkers because of their tradition of copying work that is beyond restoration. In Japan, when an old temple or Buddha can no longer be maintained, it is remade. I visited Japan often and had a difficult time bringing this work to completion and allowing it to go out into the world. When I asked Mr. Mukoyoshi about the wood and how it would behave over time, he told me that the wood would be fine for 400 years and then it would go into a crisis; after two hundred years of splitting and cracking, it would go into slow decline for another 400 years. I realized then that the wood, like the original log, had a life of its own, and I was finally able to let my project go and hopefully breathe life into the world that surrounds it. Hinoki, it seems, could almost have been created as a direct challenge the idea articulated above by Corrin about the futility “for humans to attempt to replicate what nature does by itself.” (See Hinoki arrive at the Art Institute and get installed on the second floor.) It’s a tour-de-force act of mimicry that ends up existing (like so much of Ray’s work) more on the cerebral level than the sensual. As I walked around and around Hinoki last week, I found myself remembering Mark Dion’s piece and playing a little parlor game: Which artwork is more in the spirit of W.G. Sebald? My initial inclination was that Dion’s piece, with its loving references to old natural history museums and its devotion to the everchanging cycle of nature, was clearly the Sebaldian artwork of the two. But then I was reminded of Sebald’s fascination with the obsessive skill of silk weavers and other artisans and of the interest he showed in The Rings of Saturn for a character he calls Thomas Abrams, who spent decades painstakingly creating an exact scale model of the Temple of Jerusalem. So in the end, my parlor game came to a draw. Both works led me think anew about Sebald’s beliefs in nature and in the man-made. A recurring theme of W.G. Sebald’s book The Rings of Saturn is the architecture of ruin. The reader is introduced to ruined monasteries, decrepit estates, buildings of various types left over from previous world wars, an abandoned windmill, a collapsed tower, and even a crashed zeppelin. At one point during his walking tour of East Anglia, toward the end of Chapter 8, the narrator has himself ferried over to Orfordness, once a secret research station for the Department of Defence but now an eerie set of ruins that first appear to him to be, improbably, temples or pagodas. But the closer I came to these ruins…the more I imagined myself amidst the remains of our own civilization after its extinction in some future catastrophe. Perhaps it should not be completely surprising, then, that the narrator’s next stop should be to visit the reconstruction of an historic temple and to meet its creator. In fact, possibly the only “new” structure to make an appearance in The Rings of Saturn is this still-under-construction replica of a building destroyed two millennium earlier. At the opening of Chapter 9, the narrator heads for a place he calls Chestnut Tree Farm, not far from Orfordness, where a one-time farmer with the name of Thomas Abrams has spent two decades painstakingly recreating the Temple of Jerusalem in an exact scale model. Chestnut Tree Farm is, fittingly, just off an old Roman road that the narrator has been following. Abrams’ carefully researched model, we are told, covers nearly ten square yards and includes more than 2,000 human figures, each less than one-quarter of an inch tall. Abrams is one of those “barmy” characters beloved by Sebald, whose quaint obsessiveness he finds appealing. In fact, the model for the character “Thomas Abrams” was really Alec Garrard, a friend of Sebald’s, as he revealed in an interview published shortly after the book appeared in English (Sarah Kafatou, An Interview with W.G. Sebald, Harvard Review 15, Fall 1998). 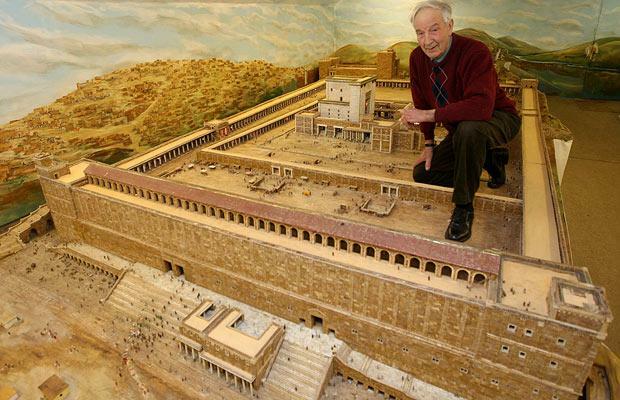 Garrard subsequently published a heavily-illustrated book The Splendor of the Temple (Grand Rapids: Kregel, 2000), in which uses his 1:100 scale masterpiece to describe the history, architecture, and functions of the real Temple, which was begun by Herod about 19 B.C. and destroyed in 70 A.D.
By the way, the back cover text of the New Directions paperback version of The Rings of Saturn rather uncharitably calls Garrard’s complex construction a “matchstick model,” as if it were destined for a competition at a State Fair.